Boulder City residents will be paying more for utilities next month as rate increases go into effect Saturday. 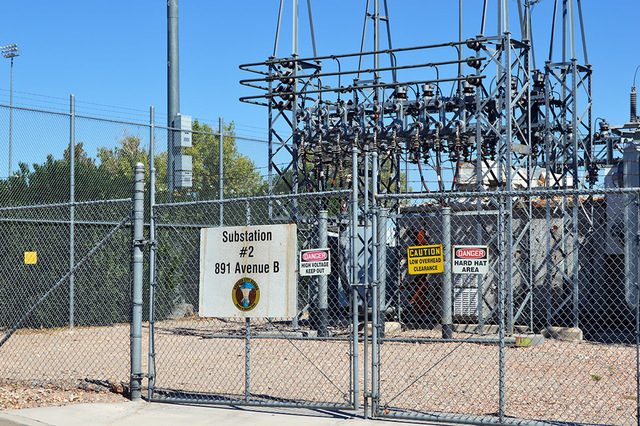 Max Lancaster/Boulder City Review Substation two at Avenue B and Adams Boulevard is one of six substations that supply power to Boulder City. The city is raising utility rates Saturday; it will be the first time that the city has raised rates since 2009. The Boulder City Council voted to raise rates for water, electric and sewer at a five-hour meeting in May. It was the first time the council had raised utility rates since 2009. During the meeting, the City Council voted for a 7 percent increase in electricity rates over the next four years and a 17 percent increase in water and sewage rates over the next three years. The rate increases will not show up on utility bills until November. The city is hosting a utility rate workshop from 5-7 p.m. Wednesday at the Elaine K. Smith Center, 700 Wyoming St., as a way to help educate people about the rate increases. The workshop will provide information on why the council decided to raise rates and help citizens better understand how the new rates will affect them. Fraser particularly was excited about an energy-assistance booth that would help people apply for programs that can help shave some money off of their bill each month. “We want people to visit the energy-assistance station we have, and hopefully that will help a few people,” he said. Councilman Cam Walker was the only person to vote against the rate increases, but since they are coming he said making the process as painless as possible was the city’s top priority. The city is working on a plan to add charts to utility bills to let people see a visual representation of how much energy they use each month. The city is posting notices on this month’s electric bills and has answers to a list of frequently asked questions on its website, http://www.bcnv.org/faq.aspx?TID=39.